I’ve been mentally preparing myself for this day for years. My oldest child is finally old enough to go to kindergarten. With so many schooling options in our area, choosing where to send my daughter to school hasn’t been simple. However, I’ve ultimately decided to send my daughter to a public charter school. With that decision, I’m heading into this school year with a much more organized and uniformed approach than I’ve used over the past five years. However, I think it’s safe to say that we are both super excited to see where this year will take us. 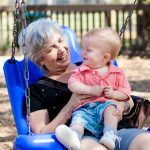 When my daughter was 2 years old, I signed her up for 2 year old preschool. 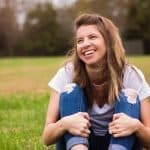 I often described her as a “Stage 5 Clinger.” In fact, for the first six weeks of school, I tearfully walked away from campus as my daughter cried in her teacher’s arms. I hated hearing her cry out for me, but was reassured that this was all part of the process. I was later told in our first parent-teacher conference that we were flagged as a “flight risk” during those early weeks, but that she finally seemed to be adapting well to school. Fast forward to earlier this year – we were accepted into a local charter school. Thus, my daughter was asked to participate in a kindergarten assessment. I have no idea what they asked or how she did. I can only tell you that she easily walked away with the teacher conducting the assessment and that we’ve since received our teacher assignment, so she must have passed. As I sat in the parent-teacher lounge, I remember thinking that all those tears were worth it. 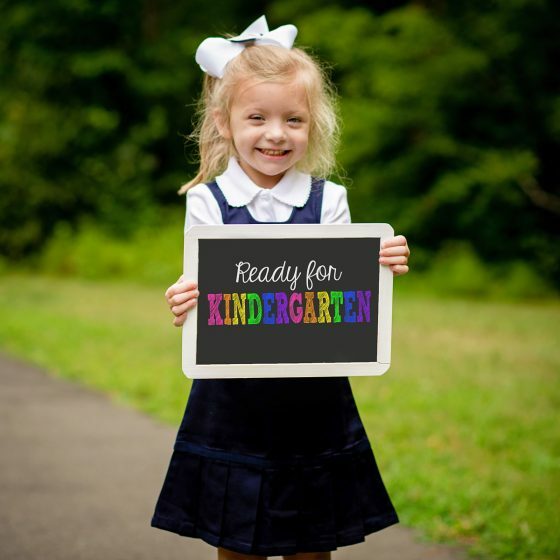 Our little girl had finally grown up and is ready to face the big world of elementary school. Now it’s August, and in a few short weeks, our summer will be over, and it’ll be time to settle into our school year routine. We’ve been working our way up to this point for the past few weeks. I fully recognize that going to school full-time will be a big transition for our entire family, and I want us to be as ready as possible. Things like laying out the next day’s clothes, making lunch the night before, or setting book bags by the door are obvious no-brainers. 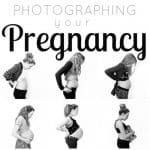 I’m also planning to prepare breakfast in advance so that I can easily heat something up in the morning and send my daughter on her way. She has a 30 minute commute to school, so I feel like that time can be spent eating rather than waking up even earlier to eat breakfast at the kitchen table. If you have a great recipe to share, please comment or send my way. Another obvious adjustment is rolling back the clock on our bedtime routine, which is no easy feat when the sun doesn’t want to set until 9 pm. Given that school starts at 8 am and it takes us at least 30 minutes to get to school (no bus provided), my daughter needs to wake up no later than 6:45 am so that we can all be out the door by 7:15 am. That’s assuming that everything runs smoothly. We all know that nothing ever runs smoothly. 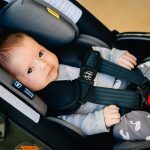 According to the National Sleep Foundation, children ages 3-5 years need 11-13 hours of sleep (including a daytime nap if your child still takes one), and 5-12 year olds need 10-11 hours. If your childs bedtime has been 9 pm during the summer like ours, and it needs to move back to 7:45 pm (be sure to factor in the 15-20 minutes it takes for most children to fall asleep), push bedtime earlier by 15 minutes for 2-3 nights over a 2-week period. You’ll also want to wake your child up 15 minutes earlier during that period. This means that our days are full. 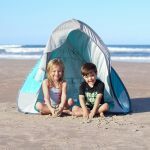 As much as I’d love to spend the last days of our summer vacation being lazy, I know that my kids will go to bed much easier if they have had a full day of physical activity. We have also kept a consistent routine that starts around 5:30 pm and includes dinner, bath, a little TV, snack, potty, brushing teeth, storytime, and bedtime. When all those steps are in place, the kids seem to be ready for bed whether it’s 7:30 pm or 9 pm. Granted, not all families have the luxury to eat dinner that early, but it seems to work for our family. Waking up in the morning requires a little more effort than we required this summer. Since we didn’t have much that required us to be in place earlier than 9 am, we mostly woke up with the sun. Unfortunately, if we waited on the sun to wake us up for school, we’d be late. Therefore, we will be relying on our iHome alarm clock. 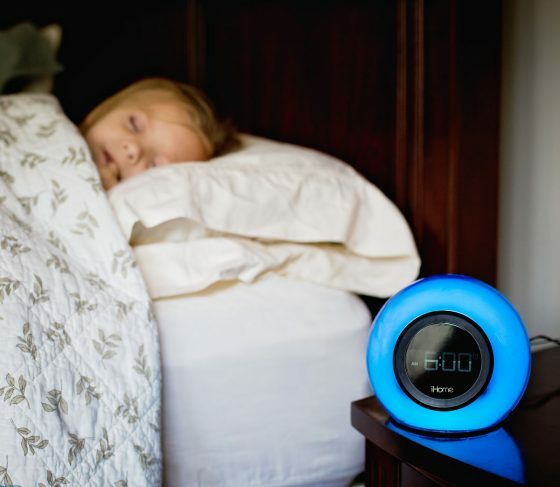 The iBT29 is a Bluetooth-enabled alarm clock that can adjust its LED cabinet color and alarm display. 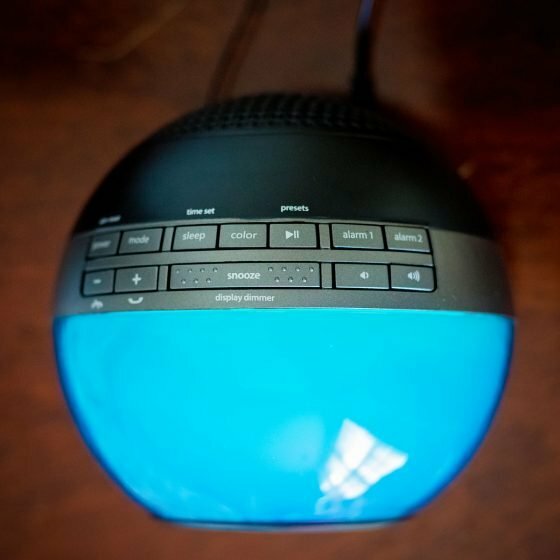 In addition to the built-in Reson8® speakers that allow you to tune into your favorite radio station (with six presets), you can stream wireless digital audio via Bluetooth from your iPhone, iPad, Android, Windows, and other Bluetooth-enabled devices OR play music from your iPhone, iPod, or other devices via the aux-in jack. The sound is fantastic – definitely not what you’d expect from your typical radio. It also doubles as a charging station for us since it includes a USB charging port. And, not that we need it, but it also includes a built-in mic, voice echo cancellation, and answer and end controls. Beyond our bedtime routine, I’m also trying to adapt to the school calendar. For years, I carried around a book-sized calendar that was organized by day, week, month, and year. It had stickers, places to doodle, and enough pages to journal if I wanted. I haven’t had a need for such a calendar in a long time, and have done pretty well with a standard monthly calendar (you know, the ones with a small 1″x 1″ square per day) for the past few years. 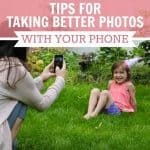 I mean, if all you’re documenting is a play date, doctor’s appointment, or milestone, why bother with a larger calendar. However, going into the school year, I feel the need to change my approach. I am still keeping my monthly calendar on our refrigerator to capture big life events, but I also need a way to track my daughter’s school activities. I can’t expect her to keep track of when specific homework assignments are due, when she needs to bring money to school for a special fundraising event, or when she should be wearing her “spirit” shirt instead of her uniform – at least not this year. 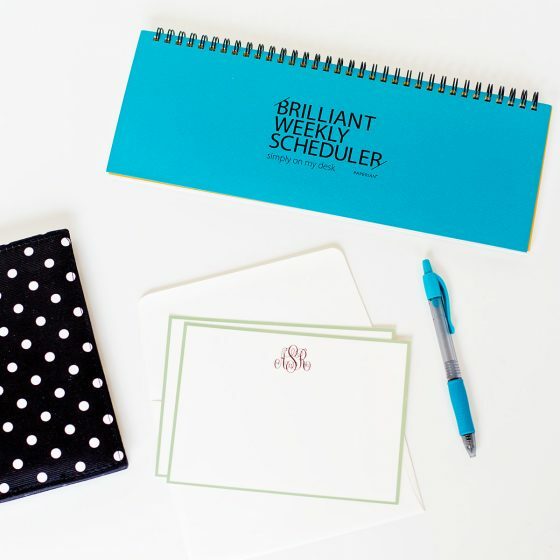 The Brilliant Weekly Scheduler is perfect for my needs. 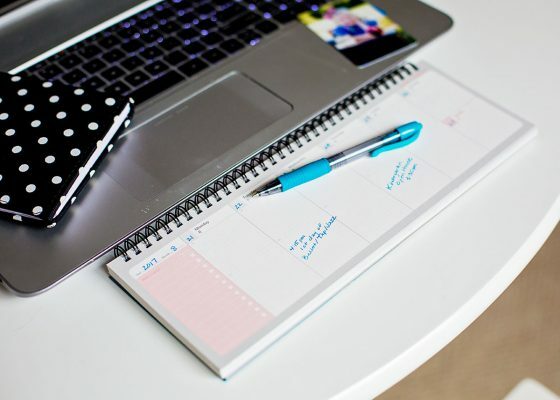 Featuring 60 dateless pages with a weekly schedule on one side and a memo area on the back side for you to jot down your notes or other memorable events, I can easily track my weekly to-do list as well as school activities. As you can see, at this point, I only have a few events on the schedule (first day of dance, school open house, and the first day of school), but my little planner heart will be full of scheduling soon enough! And it’s so small that I can toss it in my handbag if I want to carry it along. One of the bigger transitions we’re making this year is the shift towards a uniform. Up until now, all of our clothing needs have been met by my mom who owns a children’s clothing boutique. She’s a tad bit disappointed that Felicity won’t be wearing clothes from her shop, but we believe that the benefits of wearing a uniform far outweigh her disappointment. Uniforms take the competition out of dress. Concentration returns to who you are, rather than what you are wearing, or what you can afford. School uniforms keep the focus on learning, not clothing. It can be quite expensive to dress our children. 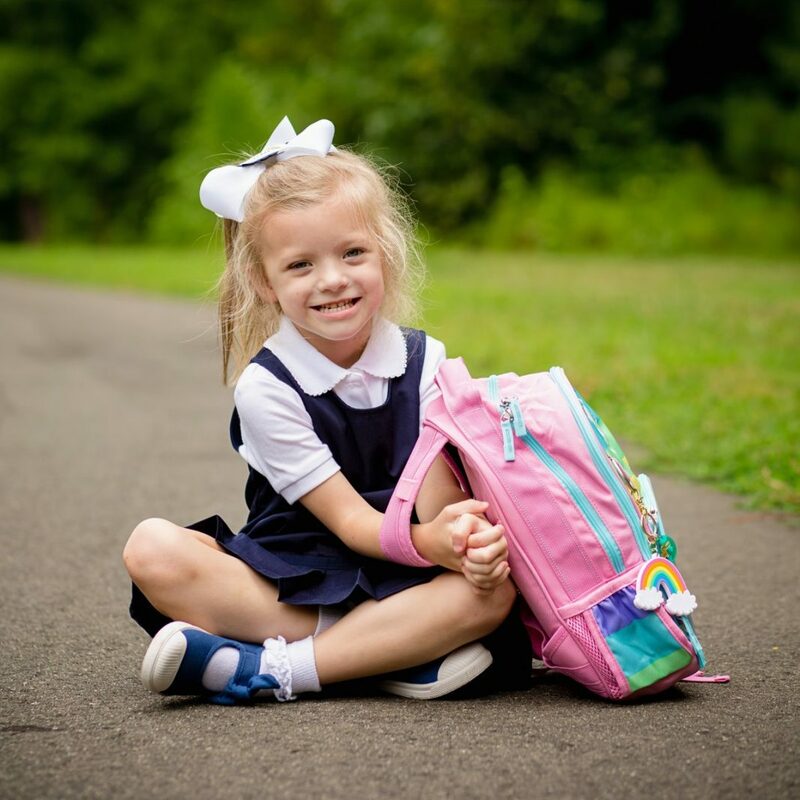 $300.00 per child is not an unreasonable amount spent on each child for back-to-school wear. But that total is for September only. Most parents continue to purchase new outfits throughout the entire school year as the weather and fashion perceptions change. That’s a lot of money that can be well spent elsewhere in most households. Uniforms are cost effective. They are less expensive. With school uniforms, everyone fits in with their school. Whether it’s music, art, sports, or academics, uniforms allow students to express and define themselves beyond their labels and fashion styles. A unique individual is developed not from appearance, but rather, intellect, personality, and skills. Uniforms do not suppress individuality, they enhance it. Uniforms add measures of safety in identical dress. Gang identification is obscured. Group violence and theft are dissipated. 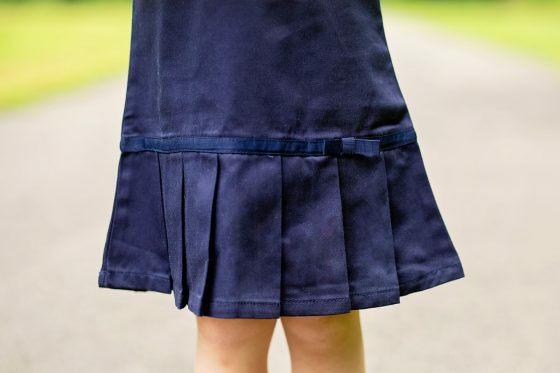 School uniforms bring safety back to the school halls. With school uniforms, incidents of theft and assault are down. Uniforms help eliminate violent crimes. Uniforms have resulted in declining truancy and increased attendance. School uniforms can allay some of the pressures that keep students from wanting to attend school. When dressed neatly and seriously, students tend to behave seriously. Often teachers find calmer, more polite, and more attentive students. Students seem to feel more confident in the way they look, and so they have more confidence in themselves. 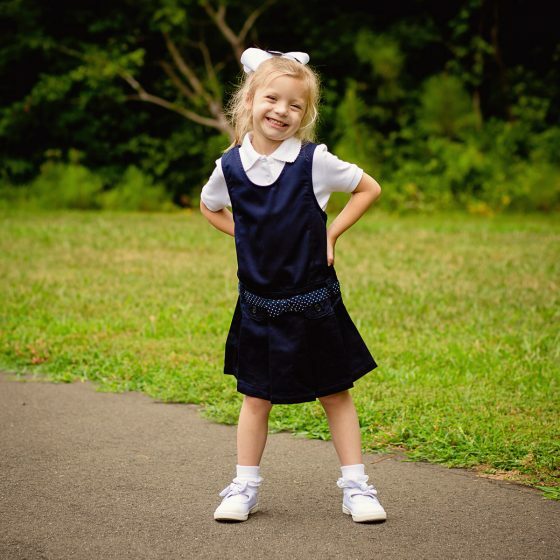 School uniforms bring an image of success to students and teachers. With all of that in mind, we jumped on board. Uniforms make absolute sense, and I’m excited to have one less thing to fight about as we get ready for school each morning. School colors are navy, white, and lime green. While our lime green polo shirts have to be purchased through the school, we can use any vendor for white polos and navy bottoms or jumpers. Thus, we’ve chosen French Toast to meet our uniform needs. French Toast offers comfortable, cost-effective, and long-lasting uniforms that perfectly meet school dress code requirements. The average expenditure for a complete French Toast uniform (pant/jumper, shirt/blouse, sweater, tie) is $45.00. Most children will require two sets of them (one to wear, one to wash). That’s $90.00 total, period, for the year. 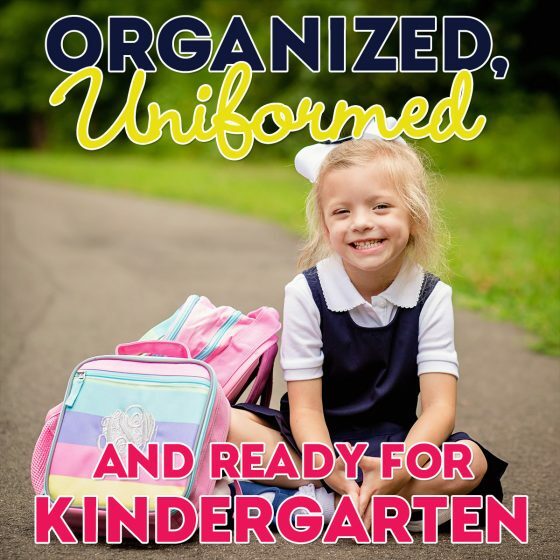 And, not only will they last your child’s entire school year (assuming they don’t hit a major growth spurt), but you’ll likely be able to hand down these uniforms to another child for continued use. At this point, we’re thinking that a white polo shirt and jumper will be the easiest for our kindergartner. As it gets cooler, I’ll trade out the short sleeve polo for long sleeves, and trade her cartwheel shorts for tights. We have two different jumper styles for her to choose from: a pleated hem jumper with a bow and a polka dot bow belted jumper. Both jumpers are a 60% cotton/40% polyester blend so you don’t have to worry about shrinkage, although I will have to keep the iron (or steamer) handy to avoid wrinkles. Speaking of wrinkles, I think one of the reasons I dreaded uniforms so much was thinking about all the ironing in my future. I’ve managed to avoid ironing (with a few exceptions) for years, but it seems wrong to send my little girl to school wrinkled. And, for some reason I feel fancy when I’m steaming. 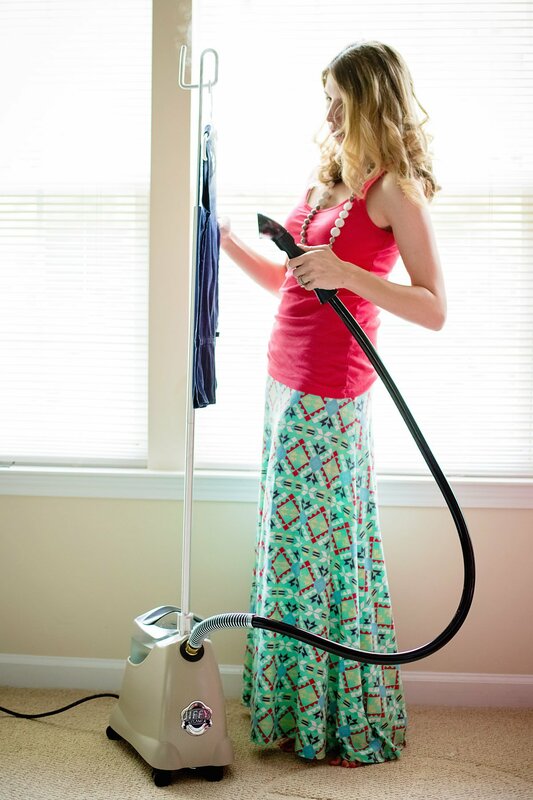 The Jiffy Steamer J-2000 quickly and efficiently removes wrinkles from most fabrics and is perfect for keeping your child’s uniforms class-ready. Steam is the gentler alternative to ironing, and is great for removing wrinkles from clothing, tablecloths, bedspreads, and delicate materials. With a Jiffy Steamer, there is no need for a temperature setting like an iron. This steamer heats up in just two minutes and can last up to 1.5 hours of steaming per filling with a convenient ¾ gallon water caddy that fits securely into the base of the steamer. So, whether you have a ton of school uniforms, your husband needs his dress shirts pressed, or you just want to freshen up your favorite blouse, the J-2000 can quickly and efficiently get the job done. It also has a unique high-impact plastic housing for durability, and wheels that swivel for mobility. Now, if you have not used a steamer before, take your time. Focus on the hard lines and steam inside and outside of the garment but be careful not to burn yourself. Much like an iron, this thing will get pretty hot, so be careful using it with small children around. Obviously, we’ll need dress code approved shoes as well. At our school, you can wear any shoe you’d like as long as it’s navy, black, brown, grey, or white. No other colors can be visible. 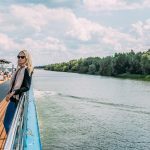 For example, if you have been rocking a pair of white converses all summer long and want to wear them to school, you can – but, you have to “black-out” the red line. A pair of Nike’s can be worn as long as the logo is aligned with school colors. No light up or roller types of shoes. No glitter or sequins. 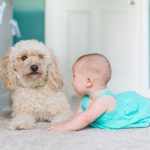 No rainbows – my daughter is obsessed with rainbows. Finding out that she would not be able to wear her favorite pair of rainbow sneakers to school was an emotional day. While it seems silly, I still want something cute for my 5 year old to wear on her feet. So, when I came across Chus, I was pretty excited. 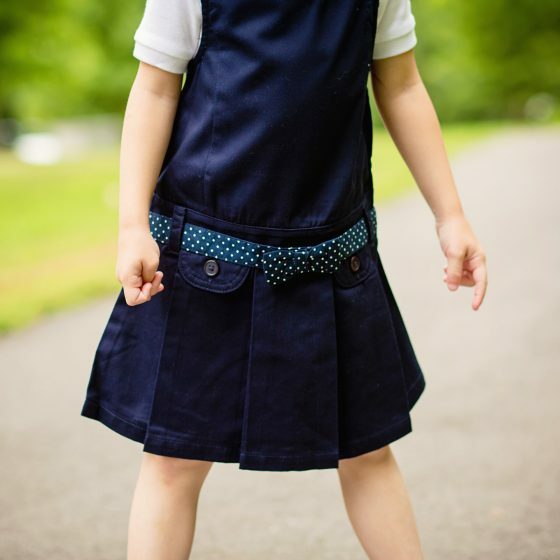 The Athena is stylish and school-approved! 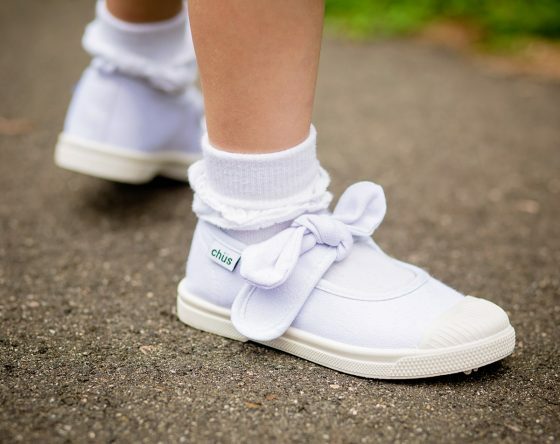 This canvas style shoe reminds me a bit of the Keds I used to wear as a child, but with a much sturdier rubber sole, and a way cuter Velcro strap that looks like a bow. I went ahead and got a pair in navy and in white just for the sake of options. Not only do they pass for everyday wear, but they also work for PE days! 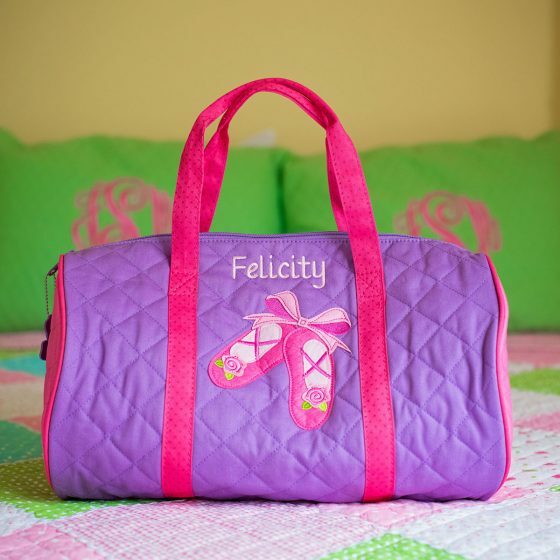 Personalization is available, so if your school allows it, take advantage of their monogramming services. These shoes are also machine-washable, so you don’t have to worry about sending a white pair of shoes to the playground and getting dirty. If your child isn’t into bows, other styles are available. Always have a snack and a bottle of water ready to go at pick up. Don’t expect to hear any details about your child’s day until after a snack and drink. Granted, a typical day of camp only lasted 3-4 hours, but I could already tell that those hours of heavy play wore her out. And based on the amount of water left in the water bottle I sent with her, she clearly didn’t drink enough water while she was away (we consistently had this problem throughout preschool as well). So, as soon as we got home, I made sure she had something to eat and something to drink before we did anything else. Truth be told, my daughter doesn’t drink nearly as much water as she should. Unfortunately, she’s not alone. 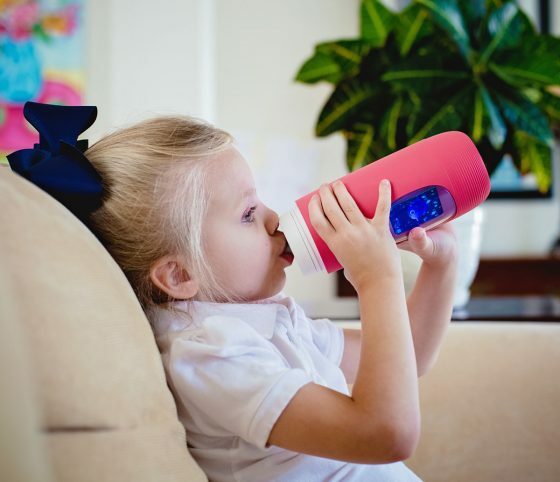 According to a recent study by the Harvard School of Public Health, over half of all children are under-hydrated, which can contribute to poor health, cognitive problems, and poor emotional development. I don’t know about you, but I’d like to believe that it’s much easier to push water than it is to treat health-related problems. 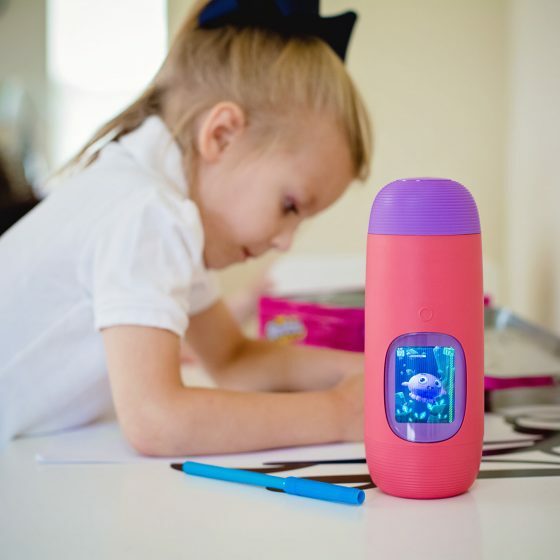 Gululu, the world’s first interactive water bottle, helps children stay hydrated by caring for a virtual pet and keeping parents informed of their children’s progress through a connected app. My daughter thinks of Gululu like her own personal video game since she has the ability to “level up” as she drinks more water and wins collectibles and rewards, and explores new stories. While cool, I’m more excited that it’s helping her develop a healthy habit. To further advance its mission to hydrate the kids of the world, Gululu has formed a strategic partnership with Generosity.org. For every Gululu interactive bottle purchased, a child in a developing country will be provided with clean drinking water for life. In fact, the first Gululu project is underway now in Peru. We are really loving Gululu, and I’m excited to make this fun pet part of our hydration routine. After a snack and a drink, it’ll be time for homework. 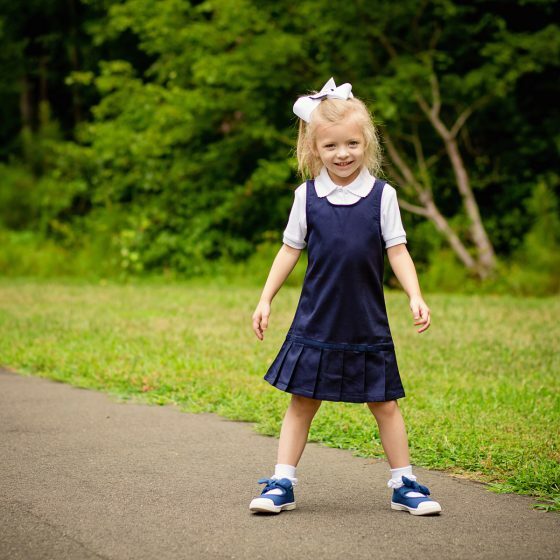 As I mentioned previously, my daughter will attend a charter school with a uniform policy. Therefore, our list of school supplies is rather boring: black composition notebooks, standard #2 pencils, etc. The school offered to pre-order your school supplies by the end of June, and we took advantage of the offer. I mean, what fun is it to shop for school supplies if there’s no real choice in what you can bring? Homework is a completely different story. Since my daughter is obsessed with rainbows, anything that isn’t under a “uniform policy” has some sort of rainbow theme. Her book bag and lunch box are obviously rainbow colors. She has rainbow labels to identify her clothing, shoes, and supplies. 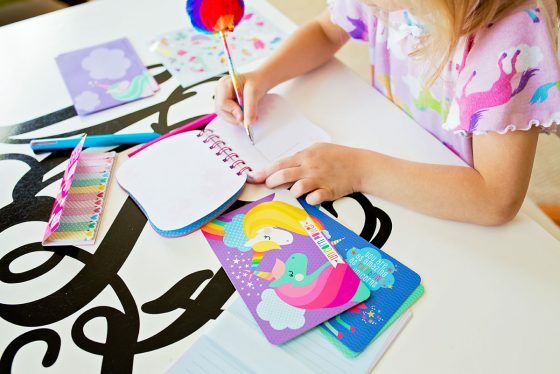 And, of course, all of our homework supplies are rainbows and unicorns. I figure if you must do something, at least have some fun with it. Our focus this summer has been to practice writing our letters and numbers. 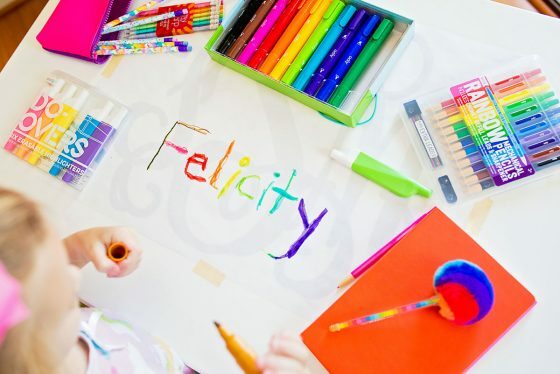 Felicity has been working on her name since she was in 3 year old preschool, but with a name like “Felicity,” it hasn’t been easy. However, I’ve recently found that writing out her name (or words, letters, numbers, etc.) using do-over erasable highlighters and then having her trace over the letters with a marker, pen, or pencil has created some muscle memory, and helped her practice her handwriting. Sometimes we use a big piece of white paper, other times we use her flipside double-sided notebook. She thinks the notebook has two purposes: side one (blank) for stickers (obviously), and side two (lined) for writing stories. Aren’t 5 year olds the best? I’ve got several different types of pencils for her to choose from: stay sharp pencils (because I hate sharpening pencils), rainbow mechanical pencils (again – no need to sharpen, but these do include a small sharpener if you want a finer point) for those days when she wants to use colored pencils, and unique unicorn pencils (which would be closest to the #2 pencil – just way cuter), along with a neon color block pencil pouch, but she much prefers the Double Dip Ice Cream Scented Markers. Up until recently, I wouldn’t even allow markers in the house because I feared the mess, but these are pretty great. 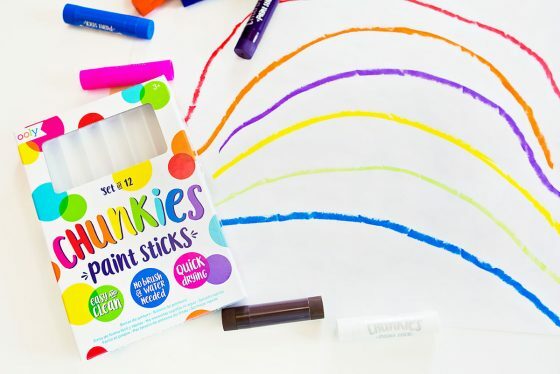 In addition to smelling like delicious ice cream flavors like watermelon popsicle pink, apple gelato green, blueberry snow cone, and grape popsicle purple, these markers are double sided. One side offers thin marker strokes, the other has a chiseled tip that makes amazingly broad and colorful lines. And, Double Dips have a special bonus as they are washable in case of any coloring accidents. Even though I highly doubt she’ll be able to use the markers for actual homework, I still think these are a great addition to our collection. Felicity also had a birthday this summer, so we’ve been busy writing thank you notes for all the fun birthday presents she received. Okay, so I’ve been the one doing most of the writing, but Felicity loves the idea of writing letters to her friends and family, so I’ve been letting her practice using this fun unicorn themed on-the-go stationary kit. 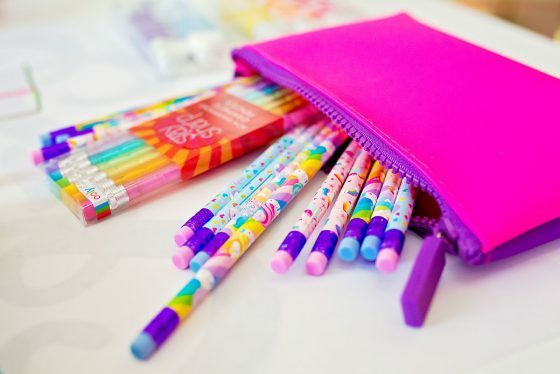 This kit has everything you need for letters, notes, and more, including 8 letter sheets, 4 envelopes, 4 postcards, a notebook, a mechanical pencil, a four color click pen, a sheet of cute unicorn stickers, and an eraser, along with a reusable traveling case. Of course, if that’s not enough rainbow for you, we’ve also got rainbow heart sticky tabs (which I think I’ll steal to use on my calendar) and a rainbow lollipop pen that I’ve regularly been using for various back-to-school forms since it has black ink. When homework is done, Felicity can dive into whatever she’d like. While I will certainly be encouraging some time on the swing set to promote that earlier bedtime I spoke of, I also know that my daughter loves art. In fact, when she laid eyes on these Chunkies Paint Sticks, she had to have them! And you know what, I love these paint sticks as much as she does. 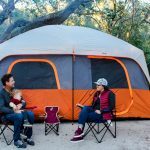 Chunkies are super easy to use, clean, and portable because theyre like painting with a crayon. Just uncap, twist, and start painting. 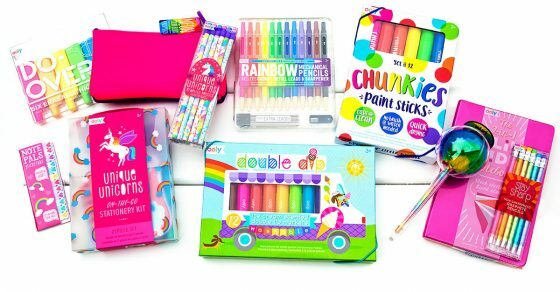 The set includes 12 different colored paint sticks each in a thick barreled casing so theyre easy for little hands to hold and recap. And while the paint colors are quick drying and wont smudge, they can easily mix to create even more colors. Its magic! 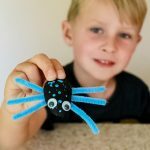 Are paint sticks a must have for kindergarten? Absolutely. In fact, I hate we didn’t know about these sooner. One day a week, Felicity will be taking a ballet, tap and jazz combination class. While I’m a little concerned about how she’ll handle a full day of school plus an afternoon dance class, I also know how much she enjoys dancing. Besides, extracurricular activities are good for kids. 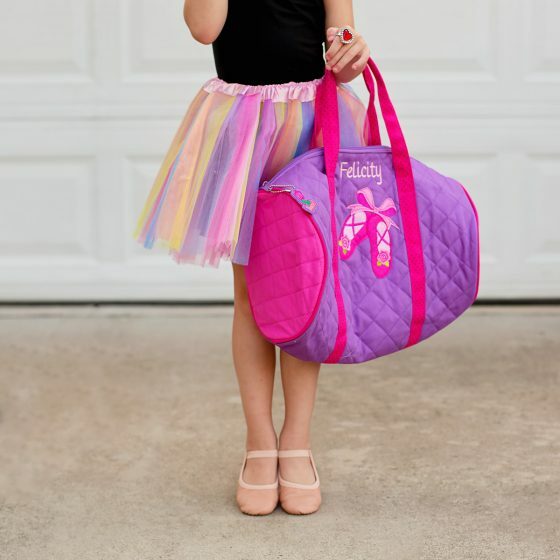 Last year we just threw her dance shoes into a hand-me-down Stephen Joseph mermaid backpack, but this year I thought it would be nice if she had her very own personalized dance duffle bag. 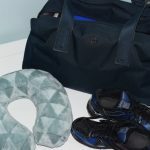 These fantastic grab-and-go Stephen Joseph Quilted Duffles are perfect for dance class, sleepovers at Grandma’s house or any other after-school activity. 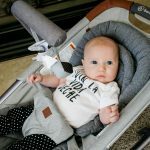 With two over-the-shoulder straps and a huge compartment, she’ll easily be able to fill it up with her leotard, ballet and tap shoes, and so much more. And while she’s graduating from the little backpack to a duffle bag, I love that the beautifully appliqued designs are still age appropriate. 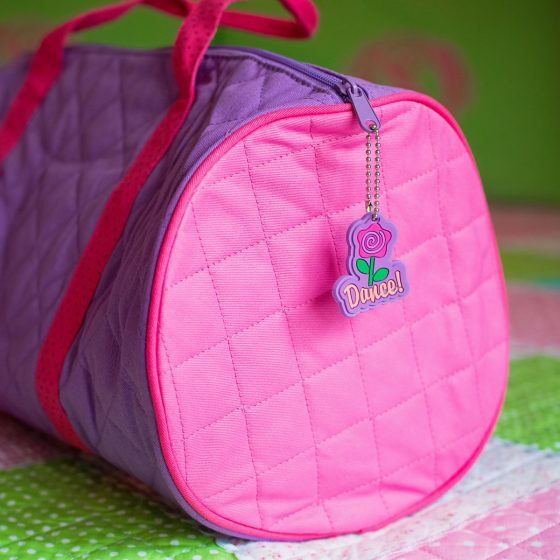 Each bag has coordinating straps and fun zipper pull, adding loads of fun to your kids activities. Well, I think that’s it. Just need to attend open house, get our “first day of school” sign framed, and we are ready to take on kindergarten. For more school organizational ideas, check out Making Back to School Easier with Labels.